There’s big money in the action sports industry. A subset of sports overall, when it comes to sports that young people 13-25 years-old want to learn, action sports, or primarily skateboarding, surfing, and snowboarding are among the most popular. Skullcandy leverages off this collision of sport, culture and apparel by creating must-have audio gear that’s become an unofficial uniform of youth. Superior growth rates, a track record of innovation, an exceptional corporate culture, charismatic leadership, compelling business models—these are some of the qualities we sought in choosing the Chief Executive’s Mid-Market Elite. Applying that criteria, our researchers and judges selected 100 companies that stand out amid the middle-market universe. Few companies can trace their lineage to Oprah Winfrey, but Scentsy of Meridian, Idaho can. Flashback to 2003. Kara Egan, and her sister-in-law, Colette Gunnell were watching Oprah’s “Millionaire Mom’s” show, and were inspired to create something amazing that people could not live without. They began working on a safe and simple way to scent the space around them, a wickless alternative to the typical flame operated candles. The result was Scentsy. When asked to describe rapid growth start-ups most people conjure up images of high tech companies, conceived in incubators and nurtured by infusions of capital from savvy angel investors. This is not the case with Chicago, Illinois based Red Frog Events. Many young college grads would be happy working for a large, well established company, especially if the slot put the young graduate on a glide path towards corporate success. This was not the case with Ted Alling. At the ripe age of 24, Alling and two friends from college decided to strike out on their own. Starting in a back office of a small Chattanooga-based construction supply company, Alling decided to take on his former employer and created Access America Transport (AAT). Since its founding in 2002, AAT has carved out a niche as the middleman between trucking companies and shippers, using organic technology to help companies keep their trailers full and shippers move their freight efficiently. Currently, AAT has some 6,000 customers including 100 members of the Fortune 500. Alling grafted a combination of an entrepreneurial spirit and devotion to customer satisfaction onto Access America Transport. “Access America is a people company,” says Alling, “A people company that does third party logistics.” Alling believes that as CEO, it is incumbent upon him to raise the energy level of his company. Yet, he continuously monitors the well being of each and every employee and satisfaction of each customer. 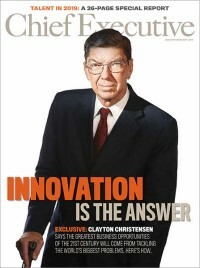 Alling is the first to say he is not an innovator. He does stress that AAT’s corporate innovation comes in two forms. The first is a high sense of urgency to the execution of transporting goods on behalf of AAT’s customers. Second, Alling strives to get smart people interested in an industry that many would not usually consider for a career path. Today, AAT’s employees more than 600-people and generates annual revenues in excess of $500 million. Operational excellence is maintained by utilizing off-the-shelf and homegrown technologies which allow AAT to drive efficiencies across all modes of transportation including truckload, intermodal and specialized freight. Outside of AAT, Alling hopes to cultivate future generations of entrepreneurs. In this vein, Alling and his partners created the Lamp Post Group - a venture capital and small business incubator. Lamp Post’s goal is to assist aspiring entrepreneurs take their ideas from the planning stages to reality through financial investment and business guidance. AAT sits at #9 on Forbes’ list of America’s Most Promising companies and Alling was recently named as one of the South’s leading young entrepreneurs by the Economic Development Partnership of Alabama Foundation. //////////////////////////////////////////////// Ted Alling Title: Co-Founder & CEO - Access America Transport Size: 600-Employees Location: Chattanooga, TN Goal: Double the workforce, break the $1-billion revenue barrier, while making Access America Transport the best place to work in America. Fact: A shipment bound from Nashville to Los Angeles ran into trouble. The only way to get the delivery to the customer on time was through chartering a jet. The company lost $35,000 but the customer got their delivery. Unique: Access America Transport has a “Bring Your Instrument to Work Day” where music fosters a sense of company as community. Livermore, Calif.-based Bridgelux occupies industry space that would be the envy of any CEO. Bridgelux creates solid state lighting (SSL) solutions to meet the growing demand for light emitting diode (LED) systems. There is tremendous demand for replacing aging technologies such as such as incandescent, halogen, fluorescent and high intensity discharge lighting with solid state lighting. Jeremy Stoppelman Co-Founder & CEO - Yelp Size: 800 employees Location: San Francisco, CA Goal: Leveraging off of Yelp’s domestic success in overseas markets Fact: Every second, a consumer generates directions to or clicked to call a local business from a Yelp mobile app. Unique: When Yelp went public, after Stoppelman pushed the button to ring the opening bell on the New York Stock Exchange, he received a call from President Obama, congratulating him.